Season 2 of Overwatch's Competitive mode is here, a few days earlier than the expected September 6th release. In an announcement on their official blog, Blizzard outlines all the changes and additions the new season and the accompanying patch will bring. As of now, PC and Xbox players are able to jump in, but there is still no confirmed date for when they are ready to go on PlayStation. Maybe it will coincide with the start of the Free to Play weekend on September 9th? The main changes in Season 2 are the removal of Sudden Death, the addition of Eichenwalde, the new map, and the ratings system overhaul. Most of these will come to no surprise to most players, as all was revealed in a developer update video a few weeks ago. There is also a long list of nerfs and buffs to the different characters, bug fixes and other minor changes. 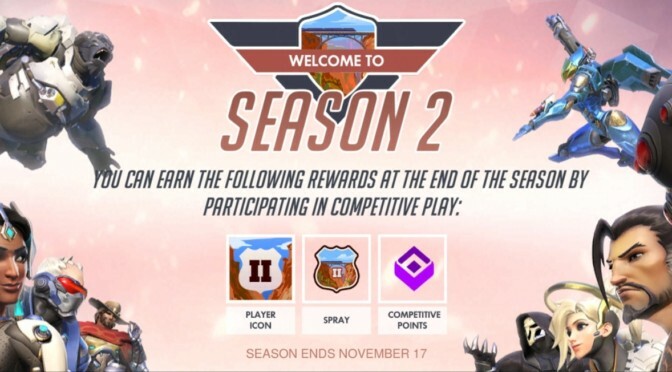 To start Season 2, players will have to go through 10 new placements matches. Once completed, these matches will determine the player's Skill Rating, which now goes from 0 - 5000, and from there they will be placed in a Ranked Tier. The new Skill Rating system will make it easier for players to see how they are doing from match to match, and will also require quite the effort to maintain for those in the higher end of the scale. Above 3000 points, the rating will automatically start to decay if the player is not staying active. 7 days without a match and points will be deducted every 24 hours. However, it will not go below 3000, so if you get to Diamond, leaving for a week will not kick you down a rank. Developers state that lower tier players will not be kicked to a lower rank if they do a few bad matches; once you have made a rank, you will not go back down to your previous tier. Only the highest leveled players will have to worry about being deranked. The new system also determinate who you are able to team up with, if there's more than 1000 points between you and your friends, you are not playing in the same match. For Master players and up, 500 points is the limit. These high ranked players, along with Diamond players, are also barred from playing with those who have not yet completed their placement matches. Sudden Death is removed, and replaced with a new approach. Depending on how much time the teams had left on the clock, a new match will start with the banked time available. Detailed information on this can be found here. All matches are now a minute shorter than last season, so there's less time to capture and defend too. If you are interested in reading the Patch Notes in their entirety, they can be found on the official Overwatch forums. You have until November 17th. Go! Zelkaar and Dito like this.